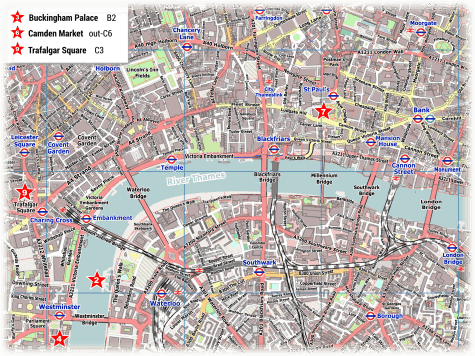 These PDF maps of London show in detail the center of the city with the top attractions and the nearest tube stations. The different versions are available here for free. Choose your favorite out of the various versions and click on the preview image to get to the respective download page. It can be quite simple to find the top destinations for your sightseeing tour. 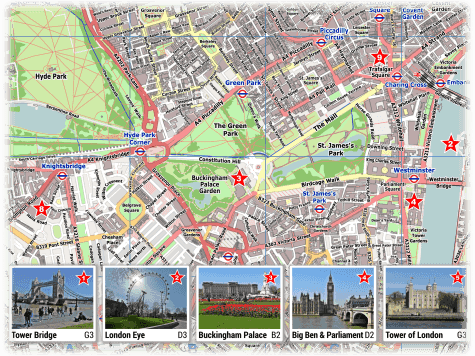 Have a look at this map and discover the attractions of London which are marked with a red star and displayed with a related picture. The accurate presentation of streets, squares and parks makes it easy for you to find your way through to the top highlights of the city. Save the PDF map on your smartphone or make a printout and you will have an uncomplicated way to orientate yourself in the center of this huge metropolis. The underground is usually the fastest option to move from one point to another, in such a busy metropolis. In the center of the city you will find a densely developed tube network which is a fast means of transportation for tourists. But the extensive line network can also be very confusing for a lot of city visitors. 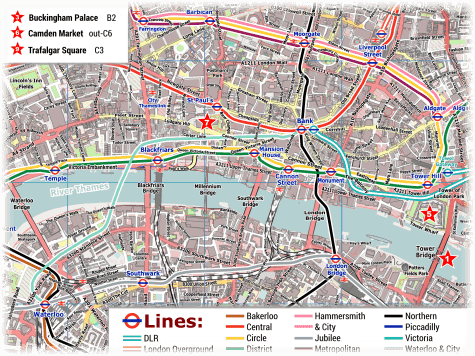 In this map you will find the tube stations connected with the corresponding lines. 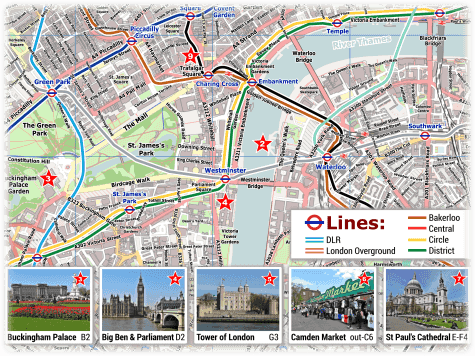 This will help you to find quickly the correct tube line and so you will not spend too much time of your city trip in the underground. The key sights are here also marked with red stars and represented by pictures. This allows you to see at a glance how to get to the most popular attractions in London quickly and without any detours. If you do not need any pictures of the top 10 sights on the map then you should use one of the following versions. The pictures are replaced here by a small text box with a legend for the red stars and due to that there is more space available for the street map. So you have a better overview on your printout or on your smartphone with the PDF download.